EcoRaft is working with educators to develop a play at home version of the installation. The game will include tie-ins to this website. In this section, parents and teachers will find links and information to help them f urther explore the project's lessons with their children and students. Here are some links to other eco-friendly sites around the web. Kids Do Ecology: Learn about ecology, conservation, and teaching about the environment. Rare Species Conservatory Foundation: A non-profit organization dedicated to biodiversity education and preservation, with information on conservation for adults and kits. 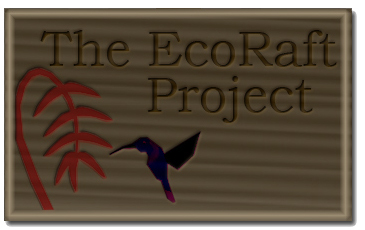 UC Irvine's Restoration Ecology Web Server: Find out about restoration ecology at UCI. ...and more resources for parents, teachers, and kids to come!